After a lot of analysis, quite a few good debates on skill versus luck, and a lot of feedback from many of the regular players of Cribbage Pro Online, we are happy to announce a completely new points system for multiplayer games that is now live effective immediately. This new points system is a lot different compared to the old system, and as such probably needs a little explaining so that everyone can have confidence in what to expect when they play. At the heart of the new system is points being given out based on how dramatically you win against your opponent. Points are awarded based off of the cribbage board position, and more specifically based on the "block" or 5 point section that the losers peg is in relative to the winning player (which on a game played to completion is always the last block with the peg out hole of course). We calculate the difference between that winning peg and the losers peg and determine how many "blocks" or sections on the cribbage board that peg is away from the winning peg. Next time you play, pay attention to which score block you are in, as each 5 point score block section will change the points awarded or taken away, so every time you get a block ahead of your opponent, you stand to get more points awarded for winning. If you are losing, then trying to get to that next block before the game is over could save you a lot of points as well. Before we get into specifics, another big change is that the same number of points you can win is the same that is lost by the other player. With that, pictured in the table and chart below is the breakdown of points awarded by that "block" mentioned above (there are 24 blocks plus a final hole for 121 on our game board). You will see that special consideration is given to the "Double Skunk", "Skunk" and if you lose by only one point (designated as block "25"). Along with this new system for determining the points to be awarded when you win, or that are taken away when you lose, is a new "Maximum Points Possible" calculation. This is a bit more complicated, but the picture you should probably have in your mind is that of a bucket of points that each unique opponent you play has to share points with you. This maximum is based on each match-up you have, each opponent you play against, and is calculated based on two different systems. The first maximum score limiting system is used when you have played 10 games or less against the same opponent. For those first 10 games you play against someone, when you win we determine what I'll call a "game win delta" or a maximum number of games you have won more than the other player - your "play advantage" if you will. So if you have won 7 games against them in the past, and they have only won 2 (a total of 9 games), your advantage is 5 games (losers games of 2 won subtracted from winners 7). 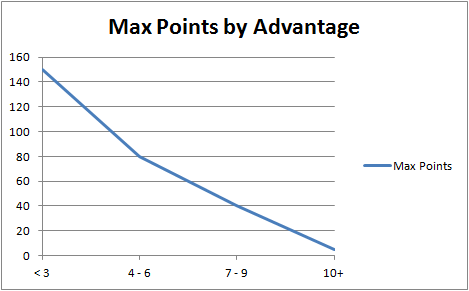 The breakdown of that maximum points possible in your match-up is as shown below. So, if you are really beating up your opponent game after game, there is now a diminishing return on your wins. What this really is doing is gauging your skill relative to that specific opponent and awarding you less if you are already the most likely winner and it will subsequently award you more if you were being trounced before but finally manage to get a win (as your delta or advantage will be negative). That system of maximum points for 10 or less games will be the one that most people will encounter as they play because of the numerous people playing and possible opponents you will face. However, for those that play more than 10 games against the same opponent, there needs to be consideration given beyond just a "games advantage", and this is where a percentage based system becomes more relevant and that is what is used. Here is how the percentage system is used to calculate your maximum points possible. As you can see, we calculate the win % of the person who lost the game (prior to adding in that loss) and use that to determine a maximum number of points won or lost. If the loser wins 46% or more against the winner, then all the points are available, but from 45% on down that maximum will slowly drop all the way down to 5 points maximum if the winner wins nearly all the time (85% or more of the time to be exact). So again, if you are always winning against that person, then it is expected that you will continue to win and there is a diminishing return on that win as you continue to prove yourself superior. UPDATE: Also note that after the first 10 games you play against someone, all "skunks" will count as 2 games and any "double skunks" will count as 3 games when calculating this maximum points possible (not in your game stats or anywhere else, only for this purpose). I'm sure there are those that will ask why we did all this, and why it is so complicated. Well, we really didn't want to make it this complicated, but we were forced into it by simply examining the system we use today and coming to an understanding where it was simply not being fair to everyone. Too many people were forced to play only certain levels of other players or risk being docked huge amounts of points for losing. Similarly, someone who only plays their spouse may be able to accumulate points rapidly if they were a cribbage expert and the spouse not so much. Is this new system perfect? No, I highly doubt it is perfect, but I do believe it is a good step in the right direction. What that means is that this will probably not be the last change you see to the points system, but hopefully it means that future changes will just be tweaks here and there. For our regular readers, this post is quite different from normal, but it is something we have decided we can not ignore and that needs more attention from everyone who is a fan of Android, or Google in general. Just recently (7/12/2011), Google started to release an update to the Android Market for devices 2.2 and above (a vast majority of devices). This update includes a complete redesign and a lot of great new features that could help everyone participating in the market. However, there is one change that is very negative all around for consumers and developers/publishers that will offset any of those positives in my opinion, but has not been discussed much. This change is in how they are now choosing to try and "rank" user reviews of apps, and in many cases only show 20 of such reviews that they are deeming "worthy". In theory, trying to find the most relevant and meaningful reviews on something is a great idea. This is in fact something Google does really well at with it's PageRank and searching of the web on Google.com It is an idea that is very much needed to help filter out the "spam" and make reviews meaningful in any App Store (sorry Apple, that is a generic term). Amazon does this quite well with their regular products (to be determined on their own "Appstore"), and now Google is trying it out on their Android Market on devices and on the web version of the market as well (it has been on the web version for a little while now). So, what is the problem then? It is a great idea, they are trying to do it, and that is all good, right? The problem is that their attempt is currently a clear failure and I can demonstrate this not only with the free version of our game Cribbage Pro, but more pointedly with Google's own self published apps as well. They are making the reviews system irrelevant, unreliable and at best completely useless to the consumer and at worst a huge negative hit for many developers. Let's take Google's "Gmail" app available on Android. This app is clearly one of the best implementations of Gmail on any mobile device, and arguable the best email app for mobile devices period. Every app has some haters, so it is would be expected there are a few negative reviews as well. To be fair, if you have the full list of reviews on your older Android Market still and take a look, you will indeed find some bad reviews and people complaining about features they want and giving a lower rating as a result. However, the app still has an overall 4.5 star rating with nearly 113,000 reviews as of this writing. It is also one of the top rated in it's category (number 3 in the "Communication" free category). It has a very good ratio of positive star ratings to negative star ratings as well, which is all to be expected for a great app. So what do the reviews say? Well, that tells a very different story. The first three reviews are always what is shown by default for each app without clicking "More" or "Read all reviews" (which does not let you read all reviews, more on that later), so let's start in. The first review shown for Gmail as of this writing is 3 out of 5 stars by "Adam" on June 21, 2011 (nearly a month ago). As that star rating would indicate, it is a mediocre review, but actually it is not a review at all. It is instead instructions on how to fix a problem that he was having with the app to help other users who may have a similar problem. Good on you "Adam" for trying to help your fellow man, but this is not a review that will help you decide if this is a quality app or not in nearly all cases, and it really can't be argued to be the most relevant review in that regard either. Let's go on to the second review shown and see if that will help us out. The second review for Gmail is a 1 star out of 5 by "mark" on Jun 4, 2011 (getting even older now). He seems to have had a problem with an update released around that time and decided to ding the app with a poor rating in response. This kind of thing happens quite often in the Android Market, and is a fair review, but does the app still have this issue? Did anyone else around the same time complain of similar issues? Sorry, there is absolutely no way to know here. It is a 1 star negative review, with no context and no way of knowing if it is still a problem or if more recent reviews may have stated it as resolved. Again, a useless and likely outdated review that is very negative for what as stated earlier is nearly universally accepted as a great app. We move on to the third and final review shown on the main app page. The third review for Gmail is also a 1 star out of 5 review, this time by "Erion" on March 28, 2011. Yes, you read that correctly. March 28th and today it is July 14th. Much older and more dated, and also a negative review of a great app. He is complaining of a missing feature to download attachments, which seems to be a reasonable complaint. So, is that still a problem nearly 4 months later? Who knows, it might be, it might not be. There is again no context of other reviews, no recent reviews showing this and no revision history by date that one could even try and use to divine that understanding. In fact, this could just be a user error and there may have been a response from another user just moments later saying so but you have no way of knowing that. We will stop there, as things only get worse and you can view what Google says is all their reviews by clicking the "Read all reviews" for yourself. The next review as shown today is from way back in October of 2010 believe it or not and also negative, and the trend continues on for a while. Interestingly, Google Gmail gives itself 4 pages of 10 reviews each that you can look at for it's app, where as nearly every other app will max out at 20 (two pages of 10; like their own published Google Search app is limited to). So without even using my own app as an example (feel free to take a look, you will see the same trends and some very old reviews), or the many others who are impacted, we see that this new "ranking" of reviews has a few critical issues. I'll outline them here for clarity. The most glaring issue that will first hit you is that the reviews being shown are almost all very old reviews in the context of how many reviews this app is getting every single day. All apps we looked at that are impacted by this problem had this very same issue. Since these reviews are not tied to a release of the app in any way (say like Apple does), and have no other reviews around them from the same time, we have no context in which to decide if this is helpful or not. This is a great app, with many great reviews. I can't link to those here because the web version now only shows these old reviews, but if you have an older Market on your device you can easily go there and see for yourself. How can an app with such high star ratings overall, and such quantity of great reviews have such an overwhelming amount of negative reviews being selected for showing in the market? The option to "Read all reviews" is misleading at best. In fact, it just shows more of a filtered and ranked list that Google has chosen to show you using it's magical black box algorithm (Google seems to like this idea of ranking things using complex formulas). There is no way to see all the current reviews, no list showing the most recent or tied to this version, and no way to rank up or down as helpful or not helpful those same reviews that have been filtered by Google. So if you don't find the current list helpful and you "down vote" them as "Unhelpful", you will have a very hard time finding a positive one to "up vote" as "Helpful", and good luck finding a recent one at all. Please Google, let's admit there is a problem here and fix it. I realize some apps don't have this problem for whatever reason the secret black box ranking is choosing better reviews (or at least not yet), but for those where it exists it really needs to be fixed. In fact, some apps that have very poor overall ratings, now are showing only positive reviews. So this problem is cutting both ways. Your changes here are hurting us, your developers and your customers, and now that you are rolling this out to devices world wide this problem is about to explode. If you have been hit by this same issue, or you disagree and want to tell us why we are just a bunch of whiny developers, let us know in the comments. We would love to hear from you. Today is a short post, but an important one. After releasing our new achievements system on Android, we found a bug in the points system for achievements when playing against the Novice computer player. In that mode, you should have been limited to the number of points you can earn towards the Top 50 (should be limited to earning each achievement about 50 times). Unfortunately, that was not happening correctly and as a result many who just played only the Novice computer a huge number of times were incorrectly placing in the Top 50. We have now corrected this, but I'm quite sure this will upset some of you who will now find your not in the Top 50 and your total points are now lower then they were as well. I sincerely apologize for that, as I know how frustrating that can feel and hope that you will understand why we had to fix this bug before things got too out of hand and the Top 50 became just a bunch of people who can beat a really simple Novice as it would make the list meaningless. At the same time, we have cleaned up the Top 50 to remove all the "Anonymous" accounts as well, which should make the list much more realistic and give other more serious players a chance to get on the list. After quite a few releases that had a heavy focus on the multiplayer side of the game in Cribbage Pro, although we always give some single player improvements too, we are really excited to finally release version 1.7 which is almost entirely focused on just the single player side of the game (coming first on Android; iOS users it is coming soon hopefully with your iPad support too). So without further delay, here is a run down of these new features in our now traditional bullet list style. You can now earn over 80 different achievements while playing Cribbage Pro on single player, and each achievement you earn gives you more points towards appearing in the "Top 50" leader boards. That's right, you can even lose a game but have an achievement earned which off-sets that loss and still move up. We think it's more fair then just earning for a win. You showed skill in earning the achievement (say a nice 24 point hand) and that skill should be represented in the rankings. Not all achievements are for showing your greatness, some of them just mark a milestone in your game play. For instance, you get one for playing 100 games, then 1000 and then 2000+ at each level of difficulty. You may also get a "19 Point Crib" achievement if you find yourself unlucky enough to have 0 points in your own crib. This is of course not a good thing, but just a common slang used in cribbage in general that we thought would be fun to add in to soften that harsh blow. Right now there are over 80, and we have ideas for even more, but would like your suggestions as well. So email us what you think might make a good achievement in the game and we will see what we can do to add it in for a future release. OK, so achievements are great and all, but what if they were not just points you could earn to get to the leader board but included other real-world rewards for significant game achievements. Once we heard of Kiip and how it worked out with the timing of our achievements release here, we got really excited as we think you all will too. If you have been lucky enough to earn one already or gift it to a friend, you know what we are talking about. For those of you who have no idea what Kiip is and why we are excited to bring it to you, check out their video on earning real rewards in games you are already playing. "Top 50" with new "Recently Played" and "All Time"
We heard you all on this one a few times, and we are glad to be able to finally start to do something about the Top 50 leader-board for single player. One of the big glaring issues was that someone who played the game over a year ago and did really well may be sitting on that list, but only now playing the game just intermittently enough to keep their spot. This first set of changes in this release are starting to address this. With the new "Recently Played" list being the default, players who have not played the game in a while will drop off the list and the list can change each and every day that ticks past giving the newer players who just found us a chance to make the list too. Of course, there is still the "All Time" list to try and get to as well. Note that we changed this for single player and multiplayer Top 50. We made the "Count" box bigger, bolder, styled it and generally made it easier to read and we also made a few other tweaks to the overall layout which I'm betting nobody notices very much, but they were bothering us so we fixed them. On Android we have been using Random.org for our random seed data in shuffling/etc. in the game for a while, but it was not as efficient as it should be and it would run out too fast at times and not be able to get new good random data (not a good enough internet connection, etc.) and be forced to fall back to using the devices random source (which we have to say almost universally terrible). So in this release we added a few new technical adjustments to that system and how we utilize it to make the cards you get (and the cards the computer is dealt) as random as we possibly can as often as we possibly can. We have already had a few requests for a list of all the possible achievements you can earn in the game, and when. Right now we will not be releasing the full list (remember, that's 80+ so it would be a long list), but in a future blog post we will list out some of our favorites and/or ones that we are getting questions. So more to come there. Cribbage Pro 1.5 Changes OR What Happened to All My Points? There are some very big changes in this new version of Cribbage Pro (1.5) which was just released early this morning 3/9/2011 PST. The list of improvements, new features and changes are actually so long that we ran out of space when describing them in the various markets and app stores where you can find Cribbage Pro today (check out CribbagePro.net for details). This blog post will attempt to cover them in more detail, but if you have questions please leave us a comment or email us at support@fullersystems.com and we will be sure to reply as soon as we can to everyone. We are very excited to finally release a tournament like option which allows you to risk your points and ranking in a "best of X" series as opposed to a single game show down. You can still play just one game where the winner takes all, but playing a best of 3 or more will allow you to avoid the loss of points/ranking from one bad game or a few bad hands. You asked, we heard you, and here it is. You can now request to be friends inside the game with anyone you are playing (open the chat to see the "Add friend" button), or by entering a user name in the Friends tab of the multiplayer screen. Selecting any of your friends allows you to view their stats, hide/show them from your list and send or view private messages with them. Messages you send are not stored in any secure fashion, so treat these as unencrypted emails being sent freely over the internet (don't send anything sensitive in any way). However, it does give you a nice convenient way to communicate with your cribbage friends without the need to exchange email addresses or otherwise. Here is where some questions are likely to arise, and where we want to be clear on what happened here and why. If you have followed the "Top 50" for a while, you have probably noticed some strange things like really high points and rankings for single player users and people listed on the multiplayer Top 50 that hardly ever play multiplayer at all. These things needed to be addressed, and so we did. The single player side of things now counts any abandoned or unfinished game as a loss for the purposes of ranking in the Top 50 (individual stats are not changed). This also changed how games are saved and loaded in the single player game which some may find as a great improvement well others will not like so much. However, it had to be done to prevent the "gaming of the system" that was clearly happening in the Top 50. We believe this should firmly resolve this kind of activity and make for a better representation of ranks. The multiplayer Top 50 side is completely redone. We have created a completely separate points and ranking/level for the multiplayer side of the house. Everyone got new points in this system based on the wins and losses they have had in multiplayer. If you have more wins then losses, then you are higher up then those with more losses then wins. We also set a baseline here so that to start with nobody was below 1500 points when we converted over. However, many are likely much lower then they were before, but over time if you win you will see your rank go back up. If you lose of course, it will go down. Another significant change here is that if you exit a game in progress in multiplayer (forfeit) you will take a loss and the other player will be given the win. If you are forced out and don't quit intentionally, the system will do it's best to determine if there could be a projected winner or loser and award the win/loss accordingly. Simply put, if you are losing and disconnected you will likely take a loss if you can't re-join. If you are winning and disconnected for some reason, you will not take a loss. These changes simply had to be made due to the constant reports of players quitting games when they are losing to avoid taking the loss. It was very unsportsmanlike conduct, and we had to find a way to punish that behavior, with the understanding that some players will undoubtedly be given a loss for a game when their phone dies or drops the connection for whatever reason even if they may have still had a chance to win. We believe this is a first in any cribbage game on any device anywhere, and are very excited about releasing it out first to our Android users (iPhone/iOS users, coming soon). How does it work? Well, whenever available it will actually take true random data from the folks over at random.org to use when shuffling the deck and making some other of the random choices in the game. If your device is connected to the internet and can get data from their service, it will be used. If not, it will use the same device generated random source as before. One point of clarification is that this change is for single player. Multiplayer has always used various true random sources for it's shuffling since day one. Android users saw the biggest changes here as with the addition of the new Friends system we had to make some more room. We hope you like the new layout and setup, but if you have any feedback or suggestions please don't hesitate in letting us know. More and more users are using newer devices with screens capable of utilizing higher resolution graphics. So, in this release for both iOS and Android we have added new higher solution images for devices that support them. It makes the game a little bigger to download/install, but we think you will really like the crisp and clear images a lot better. As always, there are some bug fixes in this release in both single player and multiplayer for both Android and iOS. Some bugs did not get fully fixed in time for release, particularly on iOS devices, so we appreciate your patience as we work through those and get out another release soon to address those (like the double tap of the deal button bug in single player, yeah we know, it's not cool, and we have a fix). Thanks again everyone for your continued support of the game, and we hope you find the new features exciting, the fixes helpful and the game even more fun to play then ever before! We are proud to announce that you can now play our top rated Cribbage Pro game on your iPhone, iPod or iPad device! Thank you all for your patience as we worked to deliver this to the market, and as usual please give us your feedback and input as we work to improve the game at support@FullerSystems.com. We would also like to thank all the beta testers who helped us make the game as great on the iOS devices as it has been for Android. You can download Cribbage Pro Now from iTunes and the App Store on your device.